This 9.48 acre tract has around 350 feet of paved frontage on Merritt Road. 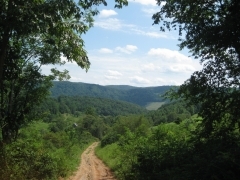 There is also an access easement along one property border, making it easier to access the rear portions of the property (the easement would need to be improved and graveled before anything other than a four wheeler or side by side used them once you start up the hillside). The front acre or so near the road consists of relatively gentle terrain and the property gets more steep as it continues up the hillside. There is an old driveway that leads onto the front of the property from the easement road. The tract is all wooded with mostly young growth mixed with some older trees scattered about. Blackberry bushes and nut trees are also scattered around the property.